In my latest series of paintings based on the ruins of nuclear power plants and other industrial wastelands I attempt to add a romantic twist of nostalgia to a subject that is so often treated with contempt. Rather than using contemporary eyes and prejudices I prefer to imagine myself as a visitor from another realm or time trying to comprehend what purpose these monumental ruins could have served. Were they sacred temples of sacrifice, colossal tombs or castle like towers of another civilization? Of course we realize that they are the cooling towers of nuclear power plants thus reminding the viewer of the possible consequences of our modern comforts and incessant consumption of energy. The first four paintings of the series are that of Three Mile Island’s iconic cooling towers. They appear as colossal megalithic ruins of modern industrial power rising from the mist of the Susquehanna River below that surround them like a moat around a castle. The towers obfuscate in the mist of the river and that of their own plumes of toxic steam integrating with the clouds above. In the foreground is a wasteland of rock and debris emerging from the mist of the river that emits the reflections of the giant towers. 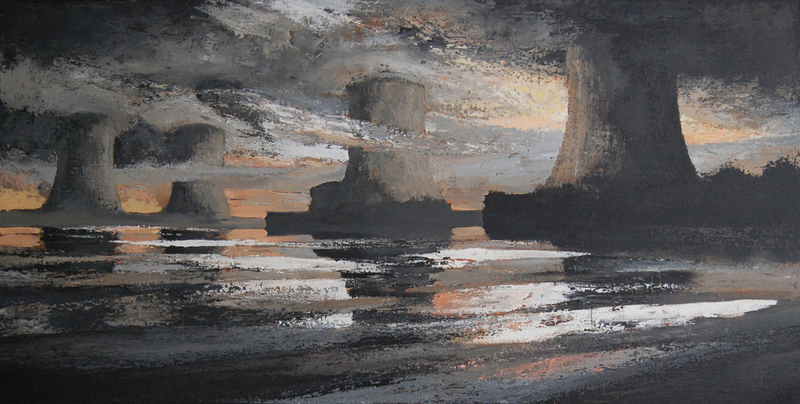 All the elements are at play here water, fire, sky and stone making Three Mile Island and other nuclear reactors an intimidating yet alluring motif for painting. By painting these industrialized motifs with the same veneration one would give to Stonehenge, the Pyramids or other megalithic ruins of the past I am able to perceive this subject with a sense of romantic nostalgia and awe. To achieve this I manipulate the paint into a thick crusty paste while working on an industrial scale to give the work a monumental presence. I apply the paint with trowels, knives, steel wool or whatever I can get my hands on. When the paint is dry I then sand and scrape the paintings with knives and razors to distress and give the surface the ruff topographical quality that I seek. The distressed surface gives the work an ancient feel coupled with the monumental scale one can have no doubt of the significance these mysteries structure most have held. We often reflect on the past with a sense of nostalgia and the future with hope and imagination but what about the present. We live and work in large prefabricated world of synthetic environments, much of our current reality is a virtual one. Buildings replace caves, TV sets replaces fire and story tellers, and malls have replaced the village market. We pay more attention to a cell phone than those in our presence. Everything from what we eat, wear and own come from distant factories that are powered by not so distant power plants. What are we evolving into and does anything really matter beyond our immediate modern comforts and needs? Is anything sacred anymore? We may have changed a lot but the striking similarities of our early ancestors and who we are today is not lost on me. Nor are the visual likenesses of the megalithic standing stones and the nuclear cooling towers and other structures we build today. So with this series of paintings I try to reinterpret a modern eyesore into a sacred monumental place of mystery and contemplation while asking the viewer to reflect upon our path of progress all the while attempting to make that which is ugly in life beautiful in art.